(See our Rentals page for more Information). New and used forklift equipment are on display at our factory and are available for inspection daily. A comprehensive range of makes and models to choose from starting with small 1 tonne models ranging through to 7 tonne models with LPG, Electric, Diesel and Petrol available. For friendly advice or just to browse, just drop in. We can provide you with a free no obligation quote at your request. We can arrange finance for all your purchasing/leasing requirements. We accept most major credit cards except for Amex, American Express and Diners. We come to you! Our experienced forklift technicians will visit you onsite and fix your forklifts’ problem. No job too big or small! We are just a phone call away. Health and Safety Practices have never been more important within the workplace than they are today. We can conduct an onsite safety inspection on your forklift and supply you with a written report of our findings. No gimmicks, no catches, just a genuine safety inspection on your forklift. We also sell Safety Log Books which are now required by Health and Safety laws. 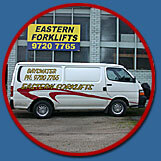 We can also arrange for you to obtain your forklift licence. Please contact us via our online form and a Eastern Forklifts team member will come back to you as soon as they can!